3" by 50 Yds. 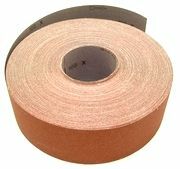 Cloth Drum Sander Roll, 150 Grit. Home > Drum Sander Rolls > 3 Inch 50 Yard Cloth Drum Sander Rolls (Plain Backing) > 3" by 50 Yds. Cloth Drum Sander Roll, 150 Grit. Aluminum Oxide "X" Weight Heavy Duty Cloth Rolls.